[The taddhitá 1.76 affixes 3.1.1 introduced from 1.83 onwards occur after 3.1.2 nominal stems 1.1 ending in 1.1.72 the fifth sUP triplet 74] to denote `arising therefrom or thence' (prá-bhav-a-ti). 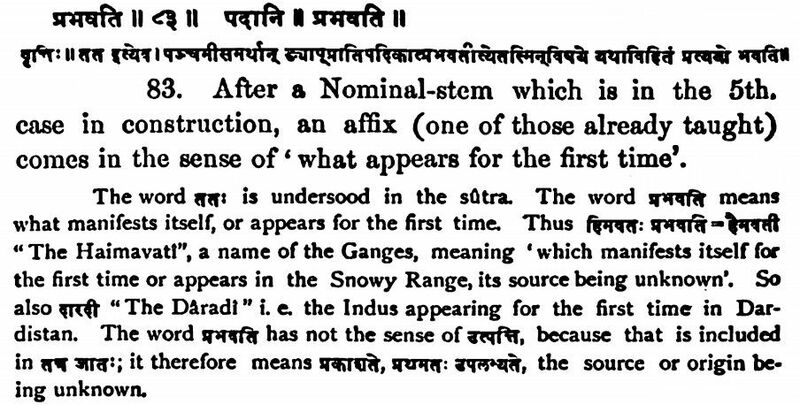 Source: From Aṣṭādhyāyī of Pāṇini In Roman Transliteration translated by Sumitra M. Katre, Copyright © 1987. Courtesy of the University of Texas Press. tataḥ ityeva. pañcamīsamarthāt ṅyāpprātipadikāt prabhavati ityetasmin viṣaye yathāvihitaṃ pratyayo bhavati. prabhavati prakāśate, prathamata upalabhyate ityarthaḥ. himavataḥ prabhavati gaimavatī gaṅgā. dāradī sindhuḥ. prabhavati 4.3.83 tataḥ ityeva. pañcamīsamarthāt ṅyāpprātipadikāt prabhavati ityetasmin viṣaye yathāvihitaṃ pratyayo bhavati. prabhavati prakāśate, prathamata upalabhyate ityarthaḥ. himavataḥ prabhavati gaimavatī gaṅgā. dāradī sindhuḥ. hetumanuṣyebhyo'nyatarasyāṃ rūpyaḥ 1440, 4.3.83 hetumanuṣyebhyaḥ. "tata āgata" ityeva. hetubhya udāharati--samādāgatamityādi. manuṣyavācina udāharati--devadattarūpyamiti. haimavatīti. himavataḥ prakāśate. tatra prathamaṃ dṛśyata ityarthaḥ. utpattivacanastu prabhavatirna gṛhrate, `tatra jātaḥ'ityato bhedena nirdeśāt. prabhavati 1129, 4.3.83 haimavatīti. himavataḥ prakāśate. tatra prathamaṃ dṛśyata ityarthaḥ. utpattivacanastu prabhavatirna gṛhrate, "tatra jātaḥ"ityato bhedena nirdeśāt.